Our first test of sequential read performance uses short bursts of 128MB, issued as 128kB operations with no queuing. The test averages performance across eight bursts for a total of 1GB of data transferred from a drive containing 16GB of data. Between each burst the drive is given enough idle time to keep the overall duty cycle at 20%. 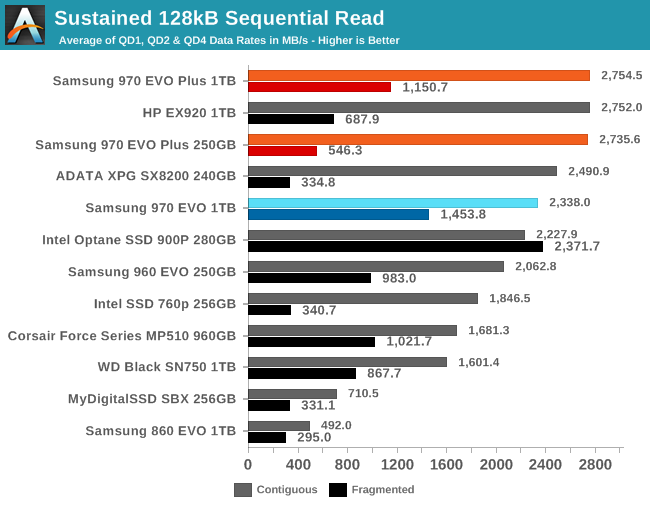 The QD1 burst sequential read performance of the Samsung 970 EVO Plus is a clear step up from its predecessors, but the Silicon Motion-based HP EX920 and ADATA SX8200 are still a few percent faster. Our test of sustained sequential reads uses queue depths from 1 to 32, with the performance and power scores computed as the average of QD1, QD2 and QD4. Each queue depth is tested for up to one minute or 32GB transferred, from a drive containing 64GB of data. This test is run twice: once with the drive prepared by sequentially writing the test data, and again after the random write test has mixed things up, causing fragmentation inside the SSD that isn't visible to the OS. These two scores represent the two extremes of how the drive would perform under real-world usage, where wear leveling and modifications to some existing data will create some internal fragmentation that degrades performance, but usually not to the extent shown here. 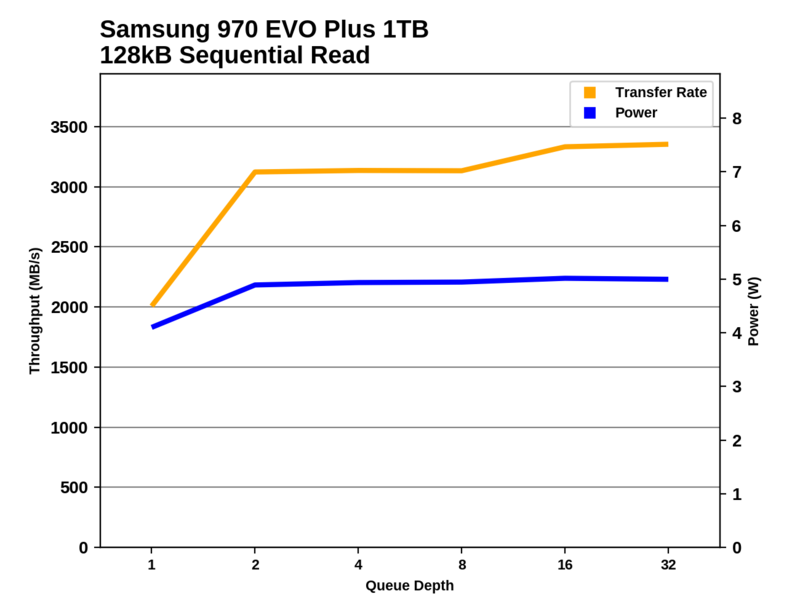 On the longer sequential read test with some higher queue depths, the Samsung 970 EVO Plus is tied for first place when reading contiguous data. 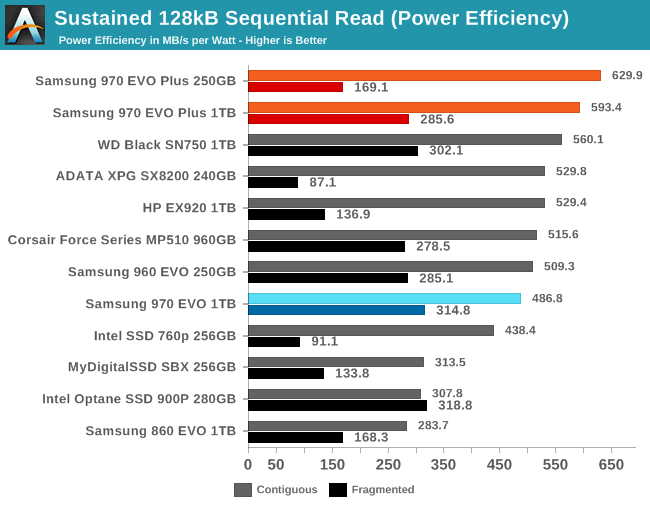 When reading back data that was written randomly and is likely to be fragmented on the NAND itself, the 970 EVO Plus's performance has regressed but is still ahead of almost all of the competition, especially the SMI-based drives that score so well on contiguous data. The 970 EVO Plus takes the clear lead for power efficiency when reading contiguous data, but doesn't stand out when the data is fragmented. The 970 EVO Plus significantly increases sequential read performance at queue depths from 2 to about 16. It doesn't quite hit full speed at middling queue depths, but it gets much closer than its predecessors, which don't improve much on their QD1 performance until around QD16. 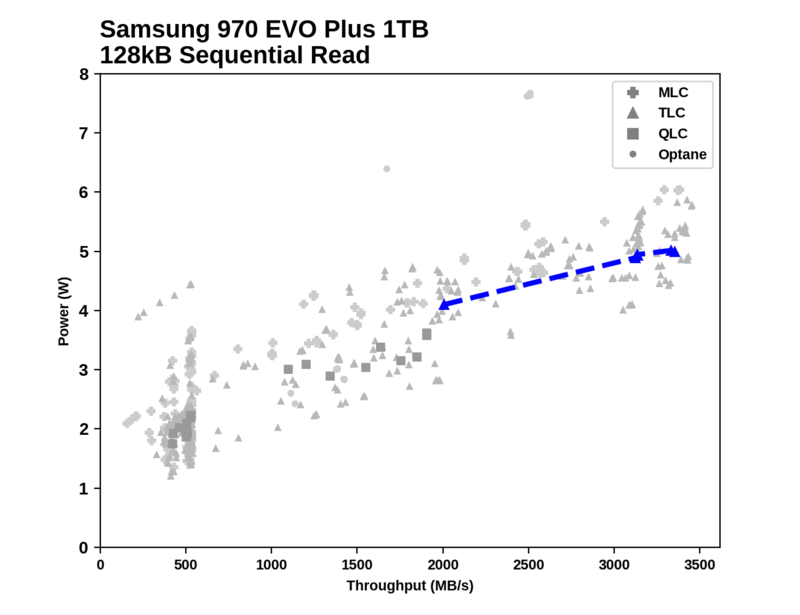 During the sustained sequential read test the 970 EVO Plus stays entirely within the upper half of the NVMe performance range, where the power efficiency competition isn't quite as strong. Below 2GB/s there are quite a few drives that are much more efficient than the 970 EVO, but above 3GB/s its power consumption doesn't stand out from the crowd. Our test of sequential write burst performance is structured identically to the sequential read burst performance test save for the direction of the data transfer. Each burst writes 128MB as 128kB operations issued at QD1, for a total of 1GB of data written to a drive containing 16GB of data. 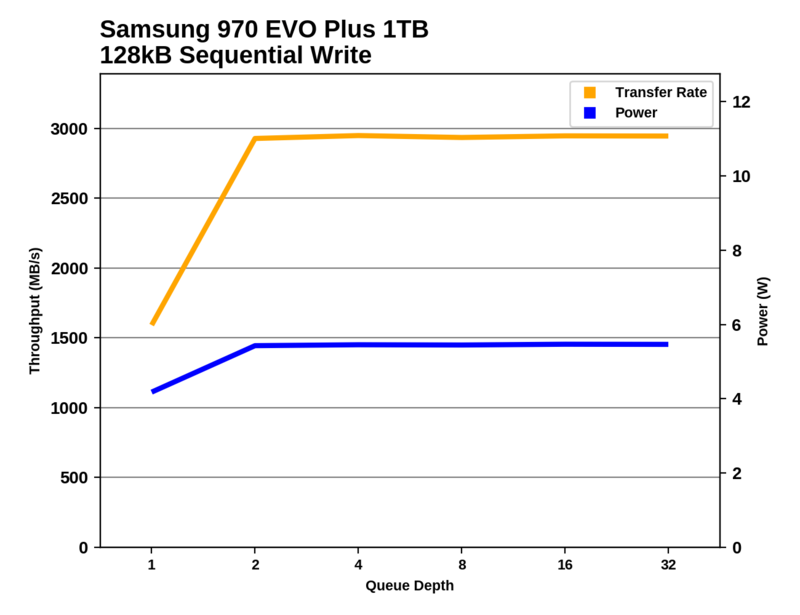 The burst QD1 sequential write performance of the Samsung 970 EVO Plus is slightly lower than its predecessor's, but the 1TB model is still clearly in high-end territory. The 250GB model looks quite slow compared to the two generation old 250GB 960 EVO, but that drive uses 128Gb TLC dies and no current-generation NAND is available in capacities that low. The reduced parallelism available to the modern 250GB drives prevent them from delivering the full performance that their older or larger counterparts provide. Our test of sustained sequential writes is structured identically to our sustained sequential read test, save for the direction of the data transfers. Queue depths range from 1 to 32 and each queue depth is tested for up to one minute or 32GB, followed by up to one minute of idle time for the drive to cool off and perform garbage collection. The test is confined to a 64GB span of the drive. 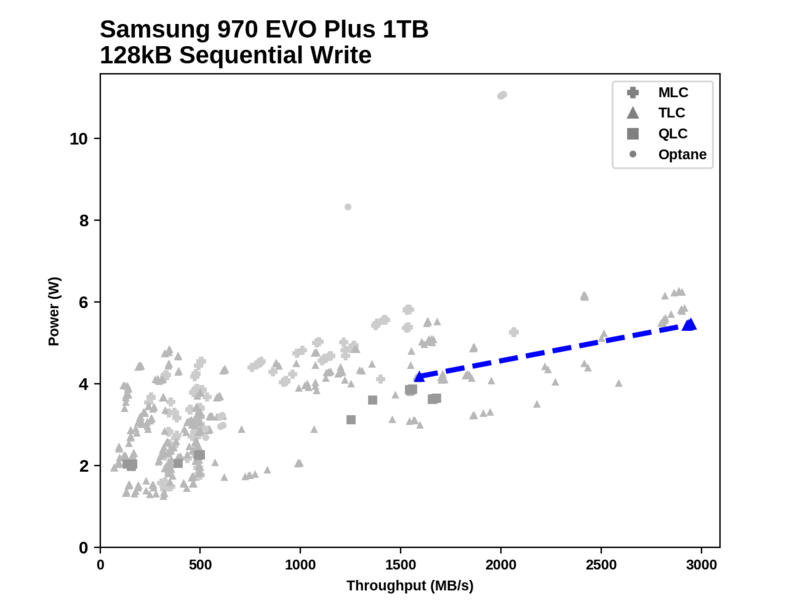 On the longer sequential write test that includes some higher queue depths, the 1TB Samsung 970 EVO Plus substantially improves upon the 970 EVO's lead. The smaller 250GB 970 EVO Plus is completely outclassed by the 240GB ADATA SX8200. In line with its excellent performance, the 1TB 970 EVO Plus tops the power efficiency ranking. The smaller 250GB model uses about 1W less power than the 240GB SX8200 but ends up worse off on the power efficiency rating due to the huge performance gap. The Corsair Force MP510 is the only drive in this batch that shows serious performance variation suggestive of the SLC cache running out intermittently. The rest of the drives are either not filling their SLC write caches entirely, or fill them part way through each phase of the test but have no trouble flushing the cache during the idle time between phases (mostly the latter). The 240GB ADATA SX8200 has such a strong advantage over the 250GB 970 EVO Plus because the cache on the Samsung drive runs out quite quickly while the SX8200's ~72GB cache is plenty large enough to handle the 32GB written during each phase of the test. Of all the drives in our database that get close to 3GB/s during the sequential write test, none use less power than the 1TB 970 EVO Plus. There are several much more efficient drives that top out at around 2.6GB/s, but the very fastest drives all require 5-6W. More substantial than the WD Black SN750. 96-layer nand is an improvement on production speed, yields, and manufacturing cost, rather than perf. And tbh, we don't need better perf at all, or maybe a bit in 4k random, because 150MBps is a bit low in 2019. Instead, what we need, is prices to drop, below twice the price of an hdd of the same capacity. Meta: has the scrolling video ad been moved to the right? It finally doesn't cover up the article when you scroll. Huge thank you.